3.4 What to Check for? Introduction: Focus is currently one of the few AOE specs in game, how ever with changes to the spec in update 3.0, the spec is now capable of doing a pure single target rotation to allow for added damage by sacrificing AOE in the rotation. This allows you to swap between a single target burst and an AOE burst depending on the situation. The further change to Focus also has shifted the rotation a bit, making it similar yet also different than the 2.0 iteration you may or may not have played. The below utilities are outlined to make the most of your Raid Utility and PVE environments. Things such as cleanses aren’t necessary and are better served for speed boosts, damage increases and buffs to your allies. Second Wind: Reduces the cooldown of Resolute by 30 seconds and causes Resolute to heal you for 10% of your maximum health when used. Trailblazer: Cyclone Slash deals 25% more damage. Narrowed Focus: Taking non-periodic area of effect damage generates 1 Focus. This effect cannot occur more than once every second. Guardianship: Challenging Call protects all allies within range, excluding yourself, granting Guardianship, which absorbs a moderate amount of damage. Lasts 10 seconds. Inspiring Force: Freezing Force increases the movement speed of all allies within 8 meters, excluding yourself by 50% for 8 seconds.orPurifying Sweep: For the Defense Discipline, Force Sweep slows the targets it damages by 60% for 10 seconds. For the Vigilance and Focus disciplines, Force Sweep and Vigilant Thrust sunder the targets they damage for 45 seconds. Sundered targets have their armor rating decreased by 20%. Through Peace: Reduces the Cooldown of Focused Defense by 30 seconds. True Harmony: Enure increases movement speed by 50% and grants immunity to movement impairing effects while active. Sub 30% Talent or Ability Buffs: Yes, execute available every so often. Accuracy: 100% Melee (110% Force). 1% from Companion, 755 Accuracy Rating from Gear. Surge: Higher Priority than Alacrity. Focus revolves around buffing yourself passively in rotation to allow for a massive hit at the end of each ‘cycle’. These cycles remain the same but if you have no idea of your passives then you won’t know how or why the cycles are there in the first place. Singularity: While Shii-Cho Form is Active, activating Combat Focus/damage dealt by Force Exhaustion grans Singulary, increasing the damage dealt by your next Focused Burst and Force Sweep by 5% and reducing their cost by 34% per stack (Free at 3 stacks). Also lowers the CD of Combat Focus by 15% and additonally generates 6 Focus over 6 seconds. Felling Blow: Force Leap and Zealous Leap make your next Force Sweep or Focused Burst automatically Crit. Zephyrean Slash: Strike, Sundering Strike, Slash, Cyclone Slash, Riposte, Blade Storm, Dispatch and Concentrated Slice reduce the active cooldowns of Force Sweep, Focused Burst, and Zealous Leap by 1 second and Combat Focus by 2 seconds. Heightened Power: Increases all damage dealt by 5% for 6 seconds after dealing damage with Force Sweep or Focused Burst. Cannot occur more than once every 8 seconds. Gravity Defiance: Increases the Critical strike damage of all abilities by 15%. Momentum: Reduces the Cooldown of Zealous Leap by 3 seconds. When Force Leap or Zealous Leap is used, your next Blade Storm deals 5% more damage and generates 1 Focus. Concentrated Power: Concentrated Slice enables Riposte and beats down the target for 45% causing them to take 5% more damage from melee attacks. Master Strike: Used in its own respective cycle. Master Strike had its damage and CD reduced to 18 seconds in 3.0 allowing you to use it more frequently and within Heightened Power windows, meaning it’s always 5% more powerful. Dispatch:Used every few cycles thanks to the profit of Focus gained from Saber Throw, a total of two Dispatches can be used in the place of Riposte before burning yourself out. It it is not ideal to use it on CD or to shift ability priority to use it. Resource costs are very strict and getting over zealous can lead to ruining your rotation. Deals more Damage than Riposte and is the 2nd highest powerful critting ability behind Concentrated Slice. Force Push: Used rarely if ever as a filler, if you’re doing your rotation flawlessly, you’ll never need a filler. The opener for Focus is rather simple and never deviates regardless of scenario. Combat Focus frontloads your Singularity and Force Leap grants Felling Blow, allowing the following Focused Burst to crit. Saber throw grants Vindicator’s Critical Bonus, giving your first Concentrated Slice an autocrit. As I mentioned above, Focus follows ‘Cycles’. 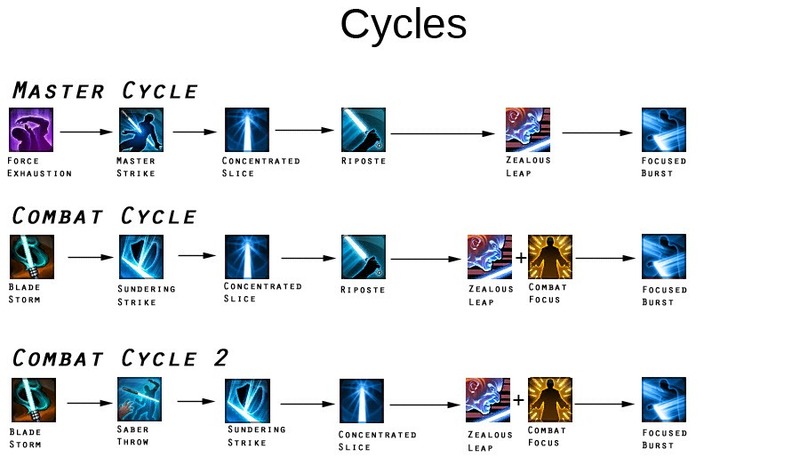 One cycle ends and another begins, each cycle ends with a Focused Burst (or Force Sweep depending on if you want AOE). Each Cycle subsequently bleeds Focus or lack there of into the next cycle, thus meaning you have to preemptively manage yourself or you may find you’re running too low on your next Zealous Leap. There are 2 types of cycles. I like to call them the “Combat Cycle” and “Master Cycle.” These cycles follow one another, when an Combat Cycle ends, the Master Cycle begins, so you can keep track of which cycle you’re supposed to be doing on the CD of Force Exhaustion as it’s the first ability used in the Master Cycle. The reason as to why there are 2 Combat Cycles is that the over use of Combat Cycle 1, the one with Riposte will eventually drain your resource due to its cost, meaning an eventual Zealous Leap will fail. To stop this from happening, substituting a 2-Focus cost for 3 Focus gain with the use of Saber Throw means you can proceed with 3 more Combat Cycle 1’s until a Combat Cycle 2 is required. The loss of DPS by subsituting in Saber Throw for Riposte, is more than made up for by the use of Blade Storm being used more frequently. To know when to use Combat Cycle 2 is easy. Once your Master Cycle finishes and your Focus Bar is entirely empty after your Focused Burst, that’s when to use Combat Cycle 2. With the large amount of Focus from your Combat Cycle 2 bleeding into your next cycles, this opens up room to allow Dispatch. Rather than subtracting 2 Focus from your current budget, you’re adding 3, this will allow you to add an extra 1 cost to your next 2 Riposte areas in the coming cycles to use Dispatch, so 2/3 Ripostes become Dispatches, the 2nd Dispatch of course is present to due to the CD on Dispatch now allowing it be used frequently. This helps not burn you out and will allow you to increase damage due to how powerful Dispatch is in comparison to Riposte.This how ever means that you will need to use Combat Cycle 2 more often to compensate for the growing cost of your rotation. What was the minimum hit of your Focused Burst/Force Sweep? You’ll see a rough deviation of 4000 max due to Relic and Adrenal windows. If you land a 12,500 Focused burst, your minimum should be the low 8000’s. If you have hit far lower than this 4k deviation, you’ve messed up a Singularity window at some point or another. The Number of Zealous Leaps+Force Leap activations = Number of Focused Bursts+Force Sweeps. Are you clipping Master Strike effectively at the 0.3 second mark? Clipping Master Strike with Concentrated secures it inside the Heightened Power window. Is your Focused Burst/Force Sweep average output higher than 10secs? If so, you’re delaying it or your rotation is too slow. So looking at the parse, let’s note some things. some are obvious, others are not. Focused burst makes up the most of your damage, about 20% to 22% and of course has a 100% crit chance due to the rotation being successful, you’ll also notice that the number (24) matches up to the (23) Zealous Leaps in rotation and (1) Force Leap in opener, the dummy died before the 25th Focused Burst, hence why there isn’t a 25th listed. Looking at the parse, you can see the APM is 40.2, well over the required 39.4. What increases your APM is mostly the use of Adrenal and Combat Focus, both of which do not respect the GCD as such should be pressed at the same time as your following ability, regardless of what it is. You’ll also notice a lack of Sweep in this parse because it deals weaker damage and its buffs are consumed by Focused Burst, hence there is no reason to use it in single target. The number of Saber Throws will be roughly half that of Blade Storm, so every 2 Blade Storm Cycles will result in one Saber Throw cycle. My in game name is Artorias/Sinais, depending on which faction you’re on of course. You may have seen me on the forums or /r/SWTOR as Luckygunslinger. I raid with Aisthesis on the Ebon Hawk and have been playing Juggernaut since 1.3 and DPS spec since 1.5 all the way until 3.0. I mained Rage pre-Vengeance Buffs in 2.6 and have decided to return to it since a lot of the minor issues have been fixed. This guide was written through the testing days of SoR when the spec was changing and it was helping to keep track of the changes while in turn helping others get an idea of this slightly versatile spec. I feel pumped up just reading this! Awesome, awesome guide!! I am gonna try this.. I have 198’s and parsing less but I have full strength augments so I’ll see tonight. Question for you. Does your dps increase with the execute rotation because I only parsed 4100 on a non debuffed dummy and without luckyshots and no health debuff on dummy either so it was straight master combat rotation plus the initial opener. Curious about the advanced cycle. How is it different from the stable cycle and will it make a later version of this guide? It prioritises other abilities in the Heightened Power window. How ever upon testing this, it yielded lower APM, probably due to unfamiliarity, and Zealous Leap wasn’t having its CD reduced fast enough to come off CD in the end of the Combat Cycle, thus you’d have to either use a filler or just cry. It was advanced because it jammed A LOT into your Master Cycle but turned out to be not worth it. I’m trying to refine it and if I do, I’ll make a post. Focus is better Burst. Always has been. At this moment, unless they make Singularity buff Sweep even more, a semi-critting Vigilant Thrust spreading all 3 Vigi-DoT’s will out do the AOE potential of Focus. The AOE for Focus is more reliable and bursty, how ever, the potential AOE of Vigilance is higher. Focus can do decent single target as proven by my parse image, but it will be 200 to 300 less than Vigilance. If you have a fight where you NEED burst, from what I can tell, possibly HM Underlurker for adds? I dunno, Focus is the way to go. But, Focus can only thrive if you know how to plan your burst effectively. My main is Guardian tank, but I was playing a bit of DPS pre 3.0. Judging by the tree now, don’t u think rotation like that would be more “dps” potent? 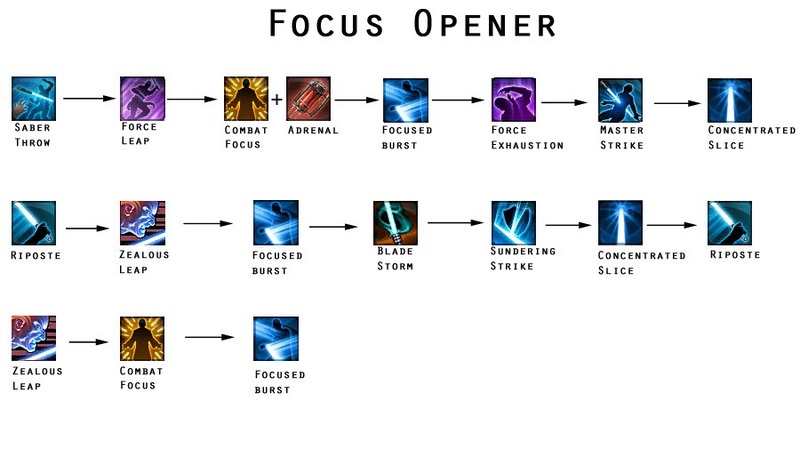 Saber Throw-> Force Leap-> Force Sweep-> Zealous Leap (Combat Focus)-> Focused Burst and so on going with yours. By doing that you are opening Heightened Power window with your Sweep and putting into it your Focused Burst with Singularity stacks. I didn’t had chance to practice it so it’s purely theoretical question. To begin, Smash isn’t supposed to be used rotationally with Burst, this was stated by the ‘higher ups’, it’s a DPS loss. To begin, an auto-crit smash now is like 3-4k, if just about anything else crits in rotation, it’ll do more damage, including Slash. The only thing that makes it out damage said abilities is Singularity, which should be used on Burst. Yes, Burst falls into Heightened power but it the loss of DPS neglecting said abilities undoes that gain, also keep in mind, the rotation is so strict that deviation from ‘X ability reduces Y’s CD’ even by a little can scew the CD’s out of alignment. Hi, thanks for your amazing guide ! I’ve a few questions. The first is about “Saber Throw” in “Combat Cycle 2”. Because of his range, you have to be 10-30m away from enemy to use it, how do you do that without losing DPS ? The second, Do you plan to make a video of this guide ? I found the problem ! I’m French, and there is a mistake in traduction of 4 pc bonus on vindicator’s equipment. With the game in English, i can see this bonus reduces the minimun range by 10 meters. Thank you again for the guide and video !. Hi, thanks for your guide, this works well for pvp? Haven’t tried it in PVP. EDIT: And Jug DPS for specs that dont need rage! I don’t do Marauder guides. I liked Combat prior to the finished product and was going to pick it up, but they changed it too much for my liking so I quit before It went live. Is this an AOE guide ? I just didn’t see here the use of the force sweep or cyclone slash ,when these abilities are highly improved on this discipline. Substitute Force Sweep for Focused Burst, done, that is realistically something you know from simply reading the tree. Hey all, just been experimenting with a few things, if it yields good results, I’ll pass it along to Dulfy to update in due time! Any chance you could update the utilities? Most of the ones you’ve listed aren’t showing up in-game. Great guide, otherwise! Haven’t used my sentinel much but this makes me wanna give ‘er some more time. Thanks! This is Guardian, not Sentinel hence why your utilities probably aren’t showing up. This is an entirely different class. Updates have been sent to Dulfy for the Utilities. I honestly don’t see how you could, it’s a very simple rotation, much easier than Pyrotech or Virulence to be honest. If you have questions feel free to ask. You have an opener, and three different rotations… and you call it simple and rate it a 5… wow… I play every class, most for fun and not saying I do them all right – I thought I had a good rotation for dps jug until reading this… but its hardly simply… I count 10 abilities in your rotation and many are up but should not be used unless it is there time, plus a clip on one ability and if you screw up your out of focus … I don’t see how a key binder can do this… you almost have to be a clicker… which boggles my mind that I’m saying that. Good luck to the DPS progression guys out there… this is Redonculous.. It is very easy. Very easy. I did this last night when I got home from work. Just set your bars up somewhat to the rotation without moving your previous specc too much. It’s a repetative rotation. The opener is 1 rotation only and Im sure your previous specc does the same before going into the main rotation. I did this last night on a dummy.. works good and is viable. Buffed without lucky shots or health and Dummy not debuffed I parsed capping at 4100 and the low end at 3800 for about 10 mins straight. It was good practice. I will tell you this, if you miss an ability you will almsot surely screw up that 1 line of rotation since it’s sort of 1 ability buffing another in chain rotating around. It is very viable pve I say. Having said that I believe it is about the same as vigilance dps. I am parsing both specs very similar with Vigilance about 100 dps higher but I’m thinking it’s because lack of practice on Focus specc. Rage/Focus is about 300DPS behind Vigilance. Sadly I don’t have much gear right now but it’s getting there. If I can get substantial upgrades i.e relics and mods, I could probably break 4600, still need my 6 piece though. It is very easy but Vigilance is better in every way. I love Focus but Vigilance beats it in every area except on demand burst and yes, that’s including AOE. I parse 4600 on vigilance http://parsely.io/parser/view/27525 Vigilance downside is ramp up time and apm s… 3 seconds off for any reason off a boss will kill about 2 actions off plus regain ramp up time. Focus is more instant damage and not dependant on dots uptime. I was searching for you in parsley but it doesn’t seem you have anything public for Artorias so I can see. Could you tell me your stats as in bonus damage and melle damage range, and crit fully or nonbuffed please so I can analyze? Let me break down your post point by point for now. An opener which is 3 abilities, if you count an opener as a part of a rotation then I think you’re on your own with that one. I call it a rating of 5 because once you learn the 2-3 rules of the -entire- spec, it becomes monotonously easy. Secondly, some are not used on CD for two reasons, an ability that deals more damage is likely in off CD as well or Focus Cost/Gain is something to take into account now or later, hence why Bladestorm isn’t used as liberally. If you screw up any rotation, your resource will suffer, this is not unique to Focus specifically. Is it that crucial to have set-bonus for spec to work? I wanted to play it, but prefer to avoid ops. For PVE you need the Saber Throw set bonus, the rotation doesn’t work without it. Singularity isn’t a stack anymore, just a set buff. That used to be the case, not anymore. This looks amazing can not wait to try it. I have one question though. This is for single target how do I adjust it for multiple enemies? Where do I add force sweep and cyclone slash? Once again this is a great guide. Thank you. Sweep when at 2 buffs. Cyclone Slash in place of everything that costs Focus except Zealous Leap. What armor style are you wearing in video? One stupid question. With the potential loss of set bonus, is it possible to replace saber throw with force stasis (traited for CD perhaps)? They both take 1.5 seconds to perform and provide equal amount of focus. Yes it’s possible, how ever keep in mind you cannot trigger your set bonus at present without the 4-piece while in Melee. As far as better numbers for putting out dps, which should I go with? Also which is better for 4.0? How can you have as much Concentrated Slices as Ripostes since you skip Riposte in the Combat Cycle 2 and you swap 2 Ripostes out of 3 for Dispatch in the execute ?